The front of some house in Mao's hometown. 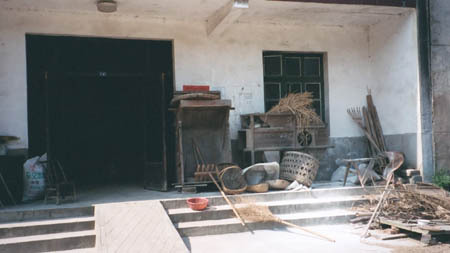 The tools look like antique decorations, but they were in use, evidenced by the drying rice spread out along the ground IN A PICTURE THAT DIDN'T TURN OUT. Eric asleep on his surrogate girlfriend. Shortly after taking this I went between cars and fell asleep on the floor. I hate hard seats. Kevin being happy, Lizzy being silly, and Steve being very, very yellow in a Suzhou garden. 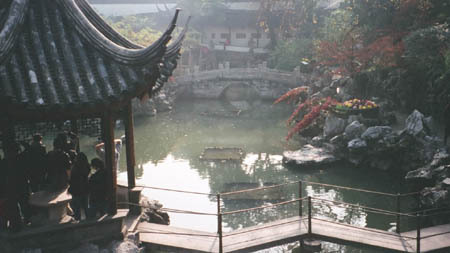 The clan down in a pagoda in this Suzhou garden view. 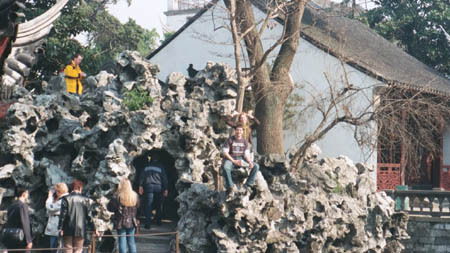 In the background you can see someone escaping from the rock maze by climbing the wall.